When a tenant approaches a landlord or a property manager to rent a property, a landlord or property manager will firstly commence a process known as tenant verification or tenant screening. It is an endeavor which is undertaken to examine the authenticity, credibility and intent of a tenant when it comes to fulfilling the terms and conditions of the tenancy contract and also administer care of the rented property. There are a number of Verification Forms used for this purpose. A tenant employment verification form is tabled when a landlord wants to authenticate the current employment status of a prospective tenant. 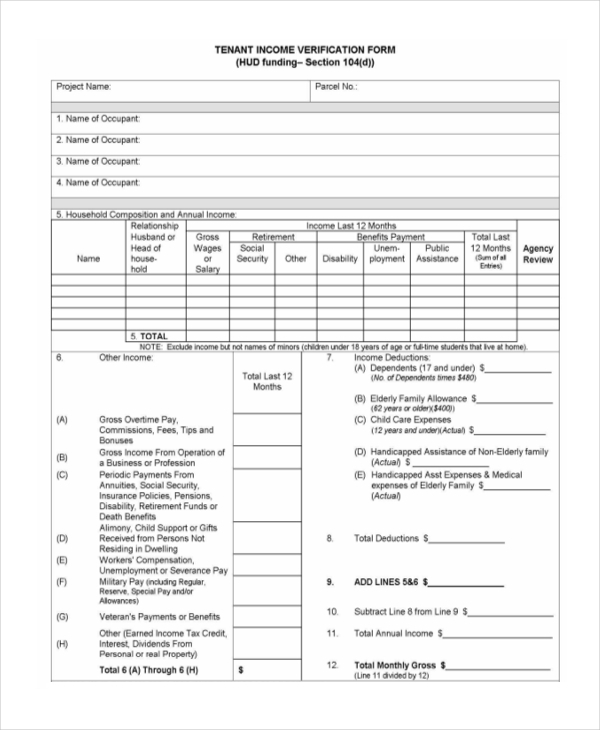 The first half of the form needs to be populated by the prospective tenant’s employer, giving data regarding the employee’s job designation, income etc. The latter of the form is an authorization letter which needs to be signed by the prospective tenant. When students apply for dorm services, the school or college authorities verify every student’s residential address. 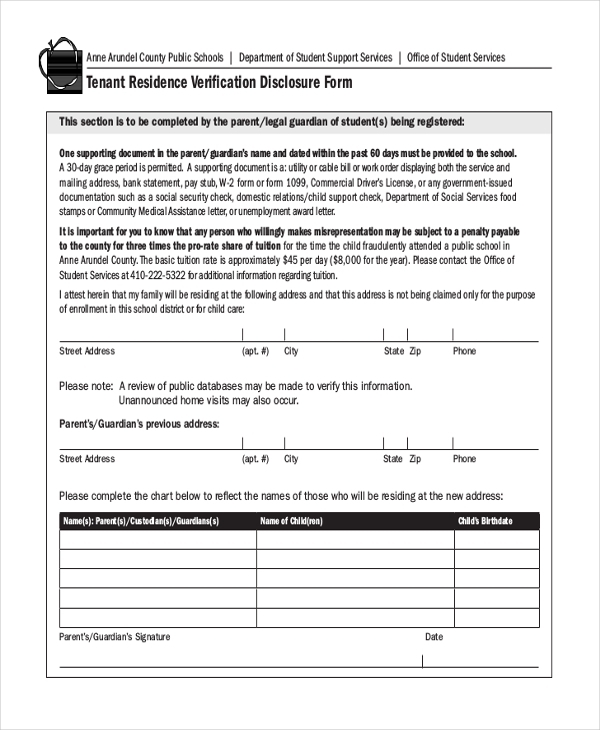 For this purpose, a tenant residential verification form is pulled out and defined with the accurate details of a student’s resident address. It is routine and mandatory for the landlord to run a verification process to know and examine about a prospective tenant’s income. This is done so that a landlord can be assured that the prospective tenant has ample income to afford the rent expenses of the rented property. 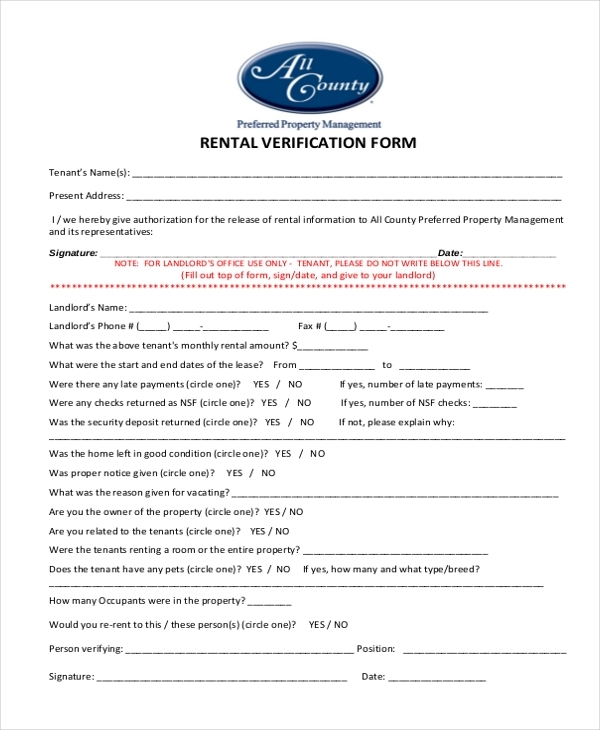 In case of housing authorities they wish to verify and confirm the rental status of a property which is rented to a particular tenant, the said tenant will be asked to sign a tenant rental verification form thereby giving their consent to the authority to release all relevant rental data which exists in the name of the said tenant. 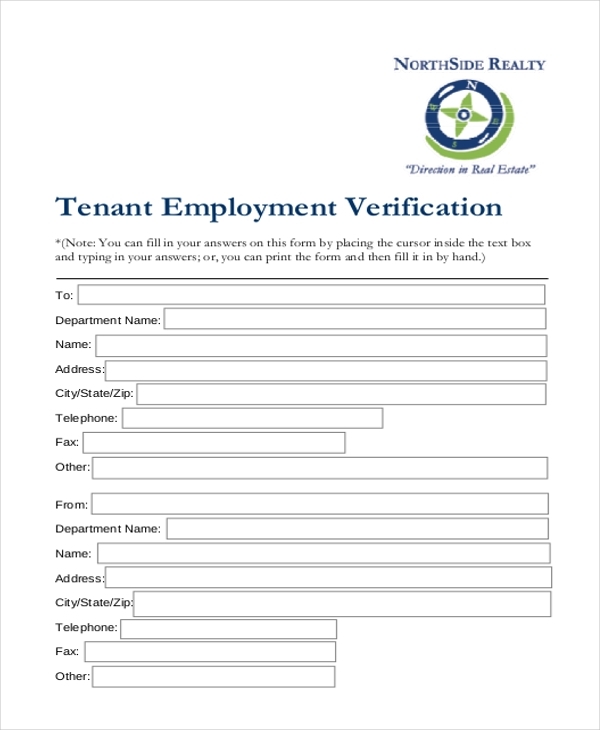 A tenant verification authorization release form is usually used in scenarios when a landlord wants to get hold of a prospective tenant’s rental housing history. 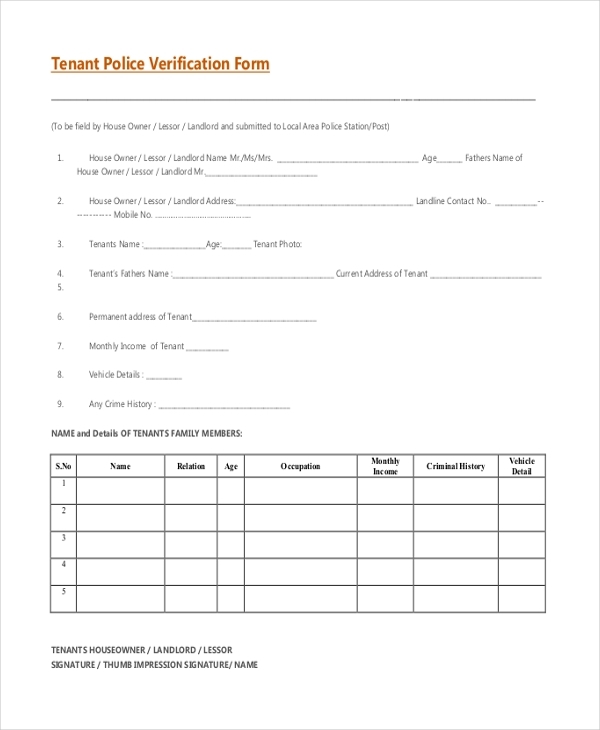 The form needs to be filled by the tenant granting the landlord permission to contact the concerned housing authority and release the required data for verification. An annual tenancy verification form gets used when a housing council or any other housing authority runs a routine check on their properties. This audit is done on an annual basis and it is undertaken to confirm whether tenants are legally living on the property, tenants’ compliance to the tenets in their tenancy agreement etc. 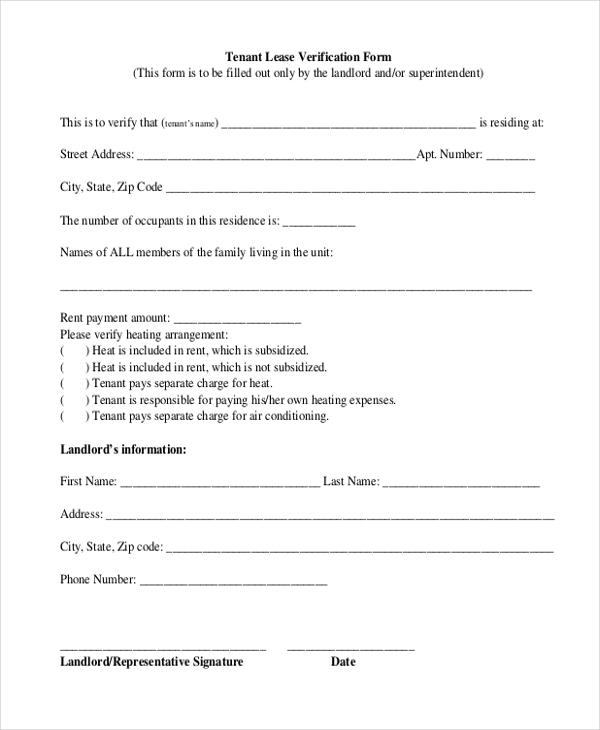 A tenant lease verification form is filled and submitted by a landlord authenticating that a particular tenant(s) is living on their property and pays the specified amount as rent for the property. Name and address details of the landlord also need to be included. In many countries, it is a norm that landlords and housing departments ask for the law’s involvement in the tenant verification process. The form needs to be accurately populated with exact information about the landlord and tenant respectively. In case there are more tenants living on the property, their names, relation, age, occupation, monthly income, and criminal history needs to be specified in the form. Tenant verification is an important exercise. It needs to be done so that a landlord is confident before renting out his property to a prospective tenant. 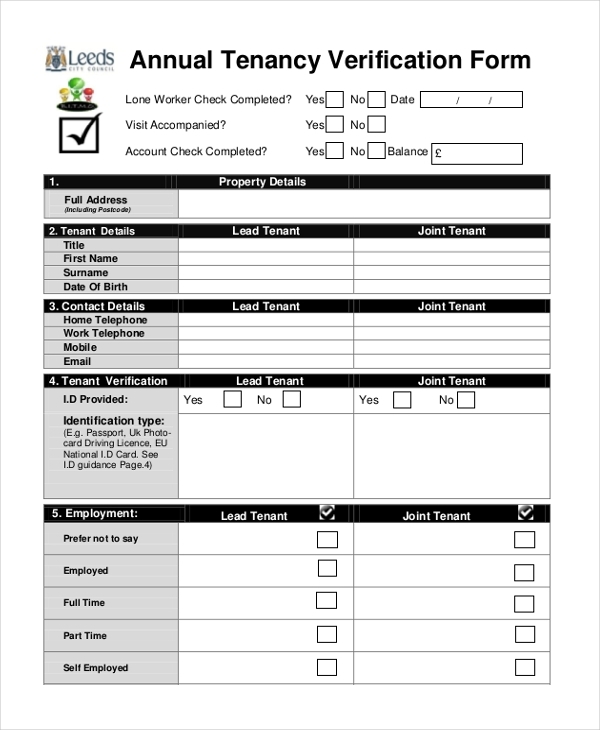 A tenant verification form is a handy tool wherein all the relevant information about a prospective tenant and a landlord can be captured systematically and can be kept on file. If and when there is a requirement for authenticating the intent of a tenant, the landlord can refer to the verification form and learn and check whatever they need to. You may also see Work Verification Forms. 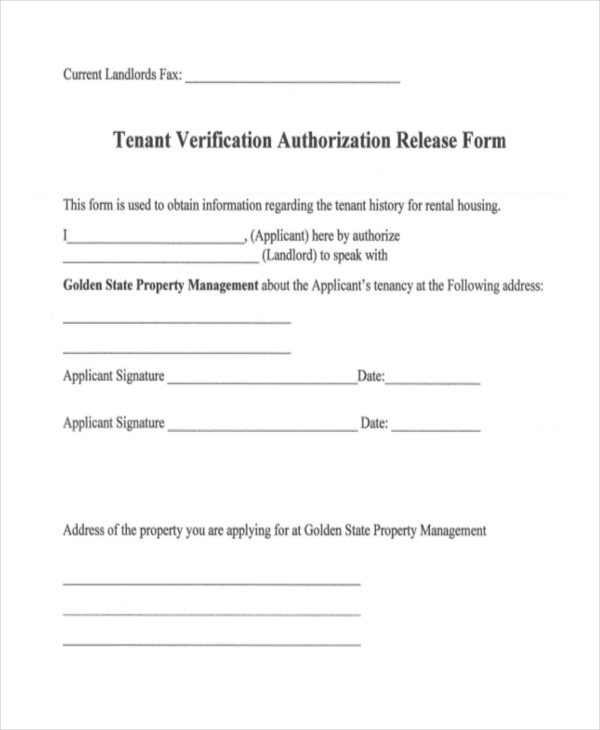 Where to get these Tenant Verification Form from? Tenant verification forms are easily available on the Internet. There are many websites on the Web which specialize in and offer free samples of tenant verification forms to users. The USP of these forms is that they are ready-made yet customizable. Users need to just download the sample of their choice and they’d easily be able to tweak it in the way you want to. The popular file formats in which the samples are downloadable are MS Word, MS Excel, and PDF. You can also see Wage Verification Forms. They say it is better to be safe than sorry. A tenant verification form symbolizes that sentiment very well. Before renting out a property to a prospective tenant, it is the basic right of every landlord to take up a verification exercise and after it is complete only then hand over the keys of the property to the tenant.